The utilisation of artillery by the British and the Boers during the Battle of Spioenkop (23/24 January 1900) may have played a more significant role in military history than previously acknowledged. The writer believes that it was the curtain-raiser to indirect fire. There has been a great deal of emphasis placed on the breakdown in command and control by the British and the Boers’ ability to advance virtually unchecked to within almost point-blank range of the soldiers in their defensive positions on the summit of Spioenkop. This undoubtedly contributed to Col Alec Thorneycroft’s controversial decision to abandon the hill and withdraw his troops, despite orders from Lt-Gen Sir Charles Warren to ‘ … hold the Kop at all costs’. The reference to artillery is significant. At around 14.30, Thorneycroft had sent a message to Warren stating that the original troops were exhausted and had no water and that unless reinforcements were sent up and proper and effective use was made of the artillery to counter the Boers’ gunfire – ‘ … I fear you are shelling our own men .. .’ – he would be unable to hold the hill. A description of the ordnance utilised by both sides is necessary at this juncture. The guns of the Royal Navy, however, will be dealt with in a separate paragraph. When the War broke out, the Royal Artillery (RA) and the Royal Horse Artillery (RHA) were organised into brigade divisions, nowadays known as artillery regiments. The Royal Horse Artillery’s role was to support the cavalry, and the Royal Artillery the infantry. A brigade division should not be confused with an infantry division, which had a brigade division of artillery attached to it. The Corps of Artillery was commanded by a major-general, and in this case he was local Maj-Gen Sir G H Marshall. The brigade divisions thus fell under General Marshall’s overall command. They were, however, commanded by a lieutenant-colonel. A brigade division of artillery comprised three batteries of guns and an ammunition column. Each battery was commanded by a major and comprised six guns – three sections of two guns each; a left, right and centre section. Each gun had a limber and ammunition wagon. This was the standard field piece that had been introduced into service in the British army in 1895. By the outbreak of the Anglo-Boer War in 1899, the 15pr had become somewhat obsolete when compared with the Boers’ 75 mm Krupp and Creusot guns, which out-ranged them. Nonetheless, because the Boers possessed far fewer guns, they were forced to use them individually or in two’s or three’s. At the outset of the War, the maximum range of the 15-pr was 5 600 yards (5 120 metres) on percussion and 4100 yards (3 750 metres) on time fuze. Case shot was also available with an effective range of 330 yards (300 metres). The gun had a basic recoil system in the form of an axletree spade connected to a spring in the trail. On firing, the spade dug into the ground, thus controlling rearward movement by the gun. This is one of the factors that must be considered when discussing the limited effectiveness of the guns on 24 January 1900. In examining the role and utilisation of the RA batteries at Spioenkop, it should be noted that the artillery for the attack was naturally drawn from General Sir Charles Warren’s 5th Division. Commanded by Lt-Col A J Montgomery, it comprised the 19th and 28th batteries, RA. The third battery – the 20th – had been sent to reinforce Lord Methuen. Besides the remaining Divisional Artillery, General Sir Redvers Buller’s force was strengthened by the arrival of the 63rd and 78th batteries. Buller also had the 61st Howitzer Battery, the 64th Battery, two 4.7-inch naval guns and eight 12pr 12cwt naval guns (nicknamed the ‘Long Twelves’). They were deployed with General Neville Lyttelton’s Brigade near Potgieter’s Drift. 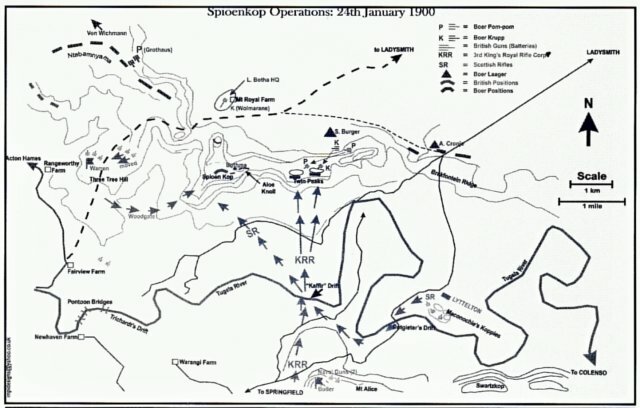 Spioenkop operations (Map drawn by Mrs Ilona Pavey). January 23 was devoted to preparations. The batteries near Three Tree Hill were tasked with supplying the main infantry attack by directing their fire towards the advance of the reinforcements, which would be illuminated with star shell. 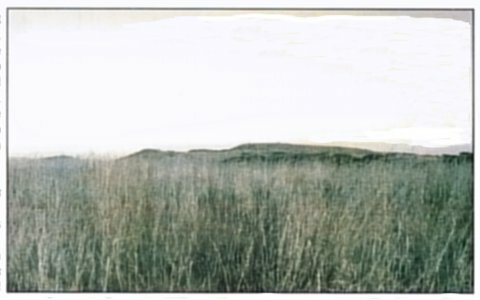 The 19th Battery was brought across from the British left flank to a position from which the guns could command the nek between Green Hill and Spioenkop. Guns were then laid on the Boers’ line and preparations made for night firing. Yet, when General Sir Edward Woodgate’s men reached the summit of the Kop, overran the Vryheid burghers, and announced their arrival with three cheers, they were greeted with a salvo of star shell, effectively informing everyone that a major movement was afoot (Headlam, 1940, Vol III, p 387). 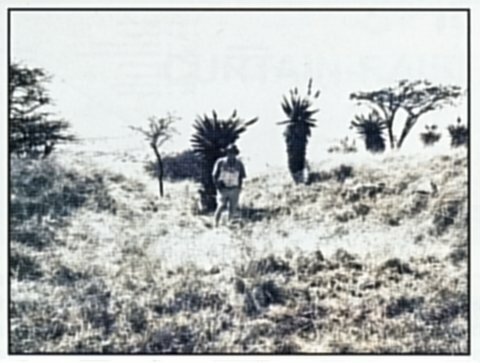 When the battle commenced on 24 January, the principal objective of the field batteries was to prevent the arrival of Boer reinforcements by dropping shrapnel over the approaches to the Kop using time fuses, while the naval guns on the right swept the slopes towards Aloe Knoll and the Twin Peaks. As the Boers’ guns converged on the British position on the summit, the hapless British commander (at that stage, Colonel Alec Thorneycroft) could only appeal for them to be checked. 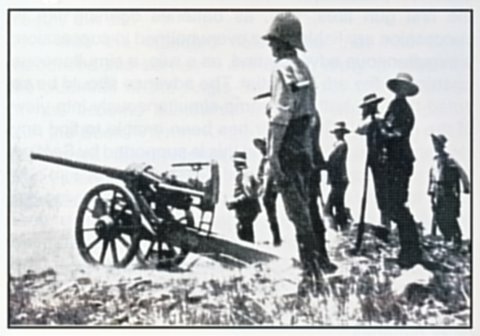 The problem facing the British was that the Boer guns were not only effectively deployed, but also brilliantly concealed from British observation. To make matters worse for them, they had no observation of the Boers’ attack. It is not generally known that Major A H Gordon, Battery Commander, 61st Battery, the only battery with an observation team, had actually sent his observers to the summit, but the signallers were commandeered by the Staff, and he therefore received no information from them. He subsequently maintained that, had he been informed of the position of the Boer guns, or indeed of the Boer marksmen, he could have dropped his shells upon them. Instead, a desultory fire continued throughout the day, mainly from the naval guns, which dropped their shells with remarkable regularity amongst their own troops. The ‘Bluejackets’ of the Royal Navy have often seen action on land. The principle of them accompanying foot-soldiers to the front was nothing new. However, the Royal Navy’s role in South Africa may be credited to the efforts of Captain Percy Scott RN, whose foresight and intuition resulted in the big guns being removed from the ships and transported to the front on carriages designed in the railway workshops in Durban. This meant that the British were able to match and even exceed the ranges of some of the Boer guns, notably the 155mm Creusot ‘Long Tom’. As mentioned above, the Naval Brigade comprised two 4.7inch and two batteries each of six 12pr 12cwt guns for the Natal campaign. The Naval Brigade was commanded by Captain E P Jones RN, of HMS Forte. Shortly before the War commenced, Captain Scott designed a wooden trail and carriage for the Royal Navy’s guns. A spade held the gun in position on firing and recoil was absorbed by an oil and spring buffer. In total, thirty 12 pr 12 cwt OF guns (‘Long 12s’) and twenty-one 4.7-inch OF guns were converted and went into the veld. According to Lt C R N Burne RN, the wheels and axles were too high and narrow and the guns frequently overturned. British naval ‘long 12’ in action in NatalThe ‘Long 12s’ had a 3-inch calibre and weighed 12 cwt (609,6 kg). They fired both common (121b 8 oz [5,7 kg]) and shrapnel (141b 1 oz [6,4 kg]) shells, the latter of which contained 200 steel balls. Their range was 4 500 yards (4 110 m) on time fuze and 9 000 yards (8 230 m) on percussion. Their muzzle velocity was 2 200 feet per second (670m/s) and their projectiles were filled with lyddite (Picric acid). Their main drawback was that the pole type wooden trail restricted elevation to a range of 7 000 yards (6 400 m), so occasionally the trail was dug into the ground to provide greater range. Three such depressions may still be seen on Gun Hill between Chieveley and Colenso. The 4.7-inch QF gun (its calibre was 4.7 inches [120 mm]) had its trials conducted on Durban beach. Scott had received a request from Gen Sir Redvers Buller for a gun that would outrange the Boers’ 155 mm Creusot ‘Long Tom’ gun. The request arrived on a Monday and the first of the guns was ready on the following Monday. This gun was invaluable to the British army. It fired a 45 lb (20,4 kg) shell 6 500 yards (5 944 metres) on time fuze and 9 800 yards (8 960 metres) on percussion. Its shells were initially packed with lyddite, but later with shrapnel. On arrival at Spearman’s camp, the 4.7-inch guns were deployed on Mount Alice. The 12prs were eased down towards Potgieter’s Drift with drag ropes. During the battle, the 4.7-inch guns fired numerous rounds over the top of the Kop and alongside it, in accordance with signalled direction from Warren’s HO. Master-at-Arms George Crowe bemoaned the fact that there was no direct fire, claiming that the shells were wasted by sending them over the summit in the hopes of hitting something. One direct hit was recorded. Shortly after noon, several hundred Boer horsemen were observed approaching from the direction of Ladysmith, escorting what appeared to be either covered up guns or ambulances. 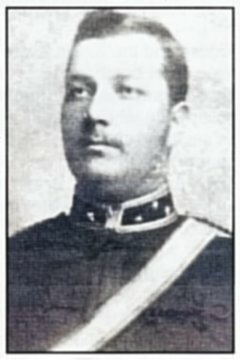 Lieutenant England RN was ordered to test what effect a shell fired at an indeterminate range would have amongst them, so the gun was given extreme elevation and directed from the foot of one of what was registered as the Roodepoort Koppies, through which it was believed the Boers would pass. The range was 18 000 yards. As the lyddite shell landed, a few riderless horses and what Crowe terms ‘ … a rapid dispersion of the unsuspecting enemy’ were observed, testifying ‘that a lucky result had been achieved, or, rather an unlucky one for them … Science meting out death at ten miles’ range.’ Then the guns were also used to cover the advance of the 3rd Battalion, King’s Royal Rifle Regiment. The Navy used telescopes to follow up the assault. Lt-Col Buchanan-Riddell used the effect of a 4.7-inch shell to storm the summit between the Twin Peaks and take the crest. Thereafter, the naval guns provided what is best described as desultory fire. 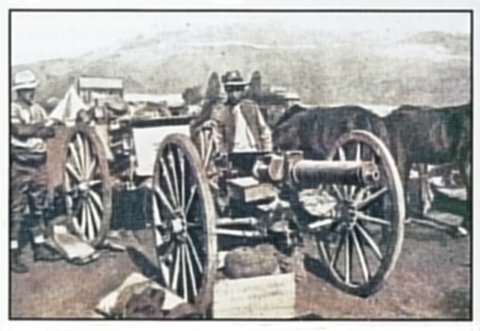 The Boer artillery was commanded by Major Jan Francois Wolmarans of the Staatsartillerie, which, besides the Zuid-Afrikaansche Republiek Politie (ZARP), was the only statutory unit in the South African Republic. Wolmarans positioned himself with one of the 75mm Krupp guns alongside General Louis Botha’s headquarters on the rear slope of Mount Royal. 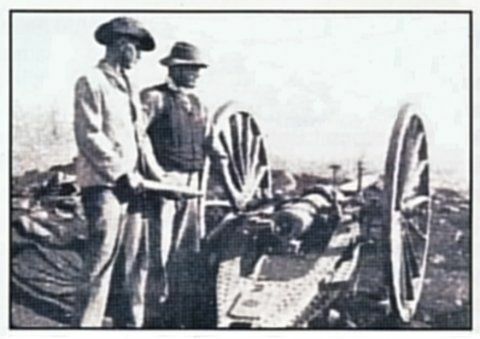 The Boers used three types of guns during the battle of Spioenkop. These were the 37 mm Maxim Nordenfelt Automatic Machine Gun (Pom-Pom), the 75 mm Krupp QF and the 75 mm Creusot QF guns. The ‘Pom-Pom’ was a quick-firing belt-fed gun. It was invented by an American named Hiram S Maxim. It had been offered to Britain but, incredibly, it was rejected. The ZAR purchased several, possibly about 25 of these guns. The Pom-Pom fired a 1 lb (0,45 kg) explosive round at a range of approximately 2 740 metres. Although its percussion effect was limited, it was a terribly demoralising weapon, nicknamed a ‘Pom-Pom’ because of its distinctive bark when it was fired, coupled to the irregular landing of its shells. The 75 mm Krupp QF gun fired both common (6,1 kg) and shrapnel (5 kg) shell. It did not have any recoil system but was very reliable. The shrapnel shells each contained 103 steel balls (97 fewer than the British 15 pr shells). The gun’s range was 3 520 metres on time fuze and 6 035 metres on percussion. According to the late Maj Darrell Hall, the ZAR and the Orange Free State may have possessed two different models of this gun. 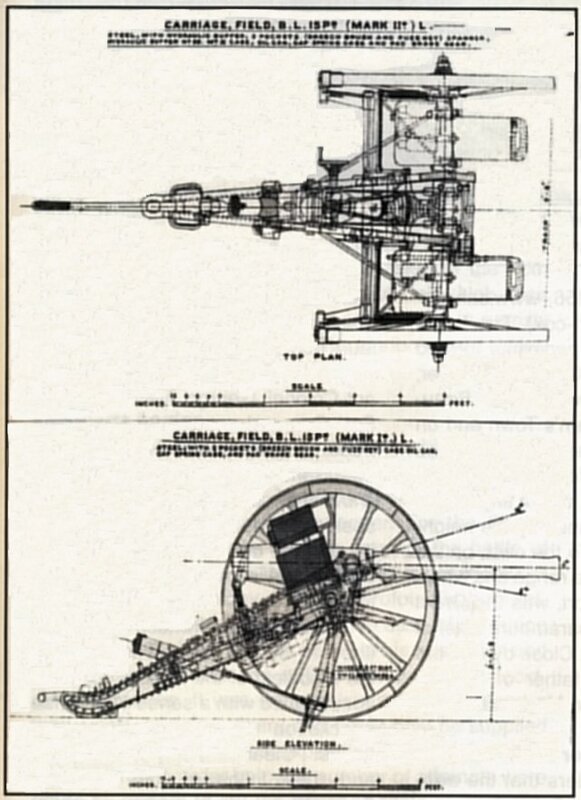 The 75 mm Creusot QF gun was possibly the first gun to have a modern recoil system. It was designed to give a far-reaching zone of shrapnel effect and therefore had a flat trajectory and high muzzle velocity. Its range was 6 200 metres on both time fuze and percussion and it fired common, shrapnel and case shell. Another innovation was that its rear tangent sight had a movable cross-head, which allowed for wind deflection. The gun was not terribly reliable, however and, as the war progressed, the buffers in its recoil system gave problems and often needed to be repaired. Another complaint was that the common shell was somewhat light for the calibre of the gun. 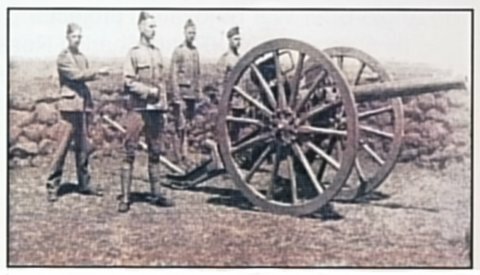 A Boer 75 mm Creusot QF gun When the Boers became aware that the British had taken Spioenkop, Commandant Hendrik Prinsloo rode across to Botha’s headquarters to obtain instructions. Botha ordered Prinsloo to storm the British position, assuring him that he would receive adequate artillery support. Prinsloo returned immediately to his position to brief his men. From General Schalk Burger, a 75mm Krupp of the Artillerie-corps van den Oranjevrijstaat was deployed on the north-western slopes of the Twin Peaks, and a Pom-Pom on the ridge west of it. From these positions, however, the ranges are 2 800 metres and 1 500 metres respectively, and they are completely hidden from view from the British guns. During the course of the battle, both guns were moved; the Krupp to within 1 700 metres of the Kop, and therefore within devastatingly close range of the target. Lieutenant Heinrich Grothaus, whose gun fired smokeless powder, swung the trails of his 75mm Krupp and Pom-Pom guns to face Spioenkop. The range was 2 900 metres from the summit of Spioenkop. Spioenkop, as seen from Lieutenant Grothaus’s Krupp gun position Botha then ordered Lt Friedrich von Wichmann to move his two 75mm Creusot field guns from Acton Homes to an area north of Lt Grothaus’s position, at a range of 4 200 metres from the summit. The Transvaal Krupp, which had been taken to the foot of Spioenkop the previous evening, was deployed on the slope behind Botha’s headquarters on Mount Royal and was personally commanded by Wolmarans at a range of 2 100 metres. By brilliant utilisation of these guns, Wolmarans created havoc for the British on the summit, with shells raining down on them with staggering accuracy. However, a great deal of credit for this accuracy must go to the heliographer, Louis Bothma. Bothma had positioned himself on level ground just below the crest of Aloe Knoll. He kept in heliographic contact with Botha for Prinsloo and directed fire onto the British position. This is interesting because, in those days, observation of fire came from the gun position itself. Bothma signalled corrections to Wolmarans, who in turn relayed them to the guns on iNthabamnyama and the Twin Peaks. It is quite likely that this was the first use of indirect artillery fire. 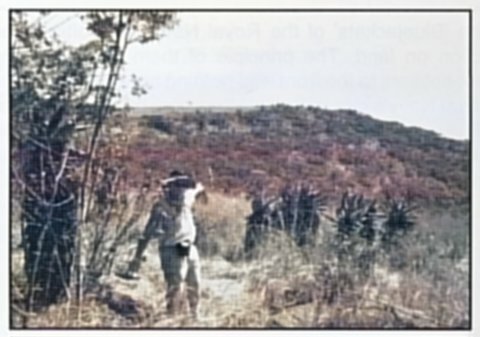 Bothma’s heliograph position on Aloe KnollDuring the course of the battle, a shell landed close to Bothma, flinging him to the ground and damaging his heliograph’s tripod. The mirrors were undamaged, however, and Bothma continued to signal from a flat stone. Warren was able to observe the devastation of the crossfire. At about 10.30, when Lyttelton had directed fire from his sector onto the Boer position in preparation for the assault on the Twin Peaks by Buchanan-Riddell and the King’s Royal Rifles, Warren, after thirty minutes of bombardment, sent an indignant message via heliograph to both Lyttelton and Buller, stating: ‘We occupy the whole summit, and I fear you are shelling us severely; cannot you turn your guns on the enemy’s guns?’ There was, in essence, no systematic attempt made to support the British infantry on Spioenkop with artillery fire. In any case, the Boer guns could not be located. Could the result have been different? This writer believes so, had the British taken some guns onto the summit. Some historians doubt the possibility, claiming that the route is too steep and that slides would have had to be constructed, but this has been refuted. The writer took part in a minute by minute re-enactment of the ascent of the Kop by both sides during the centenary of the battle. Back in 1899, the ordnance most suited for such an operation were the mountain guns of No 4 Mountain Battery, which had been left behind at Frere and were sent forward too late. The re-enactment proved that the route is easily accessible by mules, the means of transport for such guns. When Botha was informed that the British had no artillery on the summit, he expressed great relief. Whether guns were taken to the summit or not and whether the British shelled their own troops or not, is not the issue. The main issue was one of communication or, rather, the lack thereof. Indeed, it was reported in the Times: ‘There can be no doubt that to fit an army for the real conditions of war, all ranks ought to be specially trained in the passing of messages. Telephones will have to be freely used on the battlefield – indeed, there is no reason why a telegraph line should not have been taken up Spion Kop on the morning of the 24th – and before long, science may provide a really portable form of wireless telegraphy’! Davis’s account was written towards the end of February 1900, during the battle of the Thukela Heights. It would appear that the British were experimenting with indirect fire – something that they had no doubt learnt from the burgher artillerymen concealed along the iNtabamnyama and Twin Peaks. Amery, L S (ed), The Times History of the War in South Africa 1899-1902, Volume III (Sampson Low, Marston and Company Ltd, London, 1905). Barnard, Dr C J, Generaal Louis Botha op die Natalse Front (AA Balkema, Kaapstad, 1970). Breytenbach, Dr J H, Die Geskiedenis van die Tweede Vryheidsoorlog in Suid-Afrika, 1899-1902, Deel III- Die Stryd in Natal (Die Staatsdrukker, Pretoria, 1973/1978/1987). Byrne, C R N, With the Naval Brigade in Natal, 1899-1900 (Edward Arnold, London, 1902). Churchill, W S, The Boer War (Reprint, WW Norton & Company Inc, New York, 1990). Crowe, G (MAA), The Commission of HMS Terrible 1899-1902 (George Newnes Ltd, London, 1903). Davel, ‘Oom’ Chris (late of the Carolina Commando), personal interview at Spioenkop, 24 January 1975. Davis, R H, With Both Armies – With Buller’s Column (date unknown). Hall, Maj D D, The Hall Handbook of the Anglo-Boer War, 1899-1902 (University of Natal Press, Pietermaritzburg, 1999). Hall, Maj D D, ‘Guns in South Africa 1899-1902’, Parts 1 and 2 in Military History Journal Vol 2 No 1, June 1971 and Part 3 in Military History Journal Vol 2 No 2, December 1971. Hall, Maj D D Halt! Action Front! With Colonel Long at Colenso (Covos Day Books, Weltevreden Park, 1994). Hall, Maj D D, personal notes, discussion with the author and research in the field. Headlam, Maj Gen Sir John, The History of the Royal Artillery Vols II and III (London, 1937 and 1940).
. Reitz, D, Commando, A Boer Journal of the Boer War (Faber and Faber Ltd, London, 1929). South Africa, The Spion Kop Despatches (Harrison and Sons, London 1902). Taitz, Prof J, Gillings, K, Davey, Prof A, The War Memoirs of Commandant Ludwig Krause 1899-1902 (Van Riebeeck Society, Cape Town 1996). Wilson, H W, With the Flag to Pretoria, Vol I (Harmsworth Brothers, London, 1900).